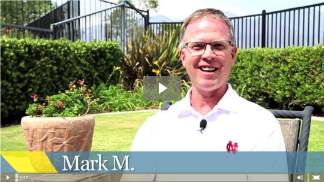 Mark was thrilled to find a beautiful home in Rancho Santa Margarita that had everything him and his wife, Jeanine, were looking for: a double cul-de-sac, beautiful views, the perfect size for their family, and a three car garage. To top it all off, we were able to get Mark a great deal on his home loan. Mark and his family have been happily living in that beautiful home for 14+ years now. Mark’s relationship with Inspira Group didn’t stop there. Over the years, we have worked with Mark to refinance his home loan multiple times and were even able to eliminate his second mortgage and drop his monthly payments. We have developed a long-term, close relationship with Mark and his family and immensely enjoy working with them. Mark feels the same way, citing the extreme integrity and dedication that Inspira Group has always demonstrated throughout the years. Mark says Inspira’s actions speak louder than words, and his experiences have always been positive, professional, personable, and efficient every single time. We love hearing that, and we know that that’s the commitment we make to all of our clients. With clients like Mark, it isn’t hard to do! We love having you as a client, Mark! We know that integrity + relationships = the foundation for success in home buying, selling, or refinancing. If you need refinancing, or are looking for the perfect home, meet with our team today so we can get started building another fantastic relationship!